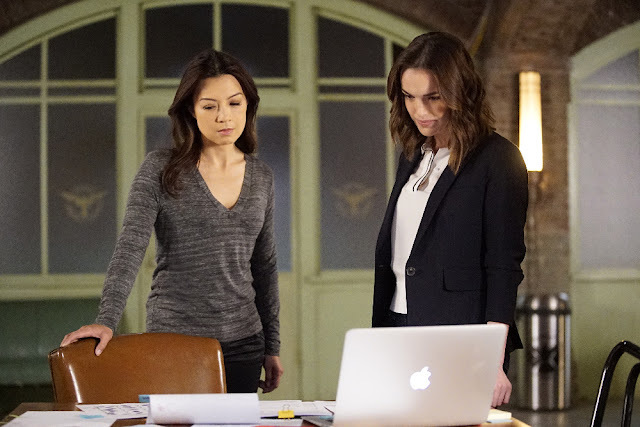 Last week, two integral members of S.H.I.E.L.D. were disavowed. How will things go down after their departure? Let’s find out. Spoilers! Reminder: Agents of S.H.I.E.L.D. contains PG-13 level content. The episode begins in Naperville, Illinois where Mack is hanging out with his brother Ruben in the garage while he fixes Ruben’s bike. They discuss Mack’s job supposedly working for an insurance company, and Mack says things at his job aren’t going so well--two of his closest friends just got transferred. Things for Ruben aren’t going so well either--he just got laid off. 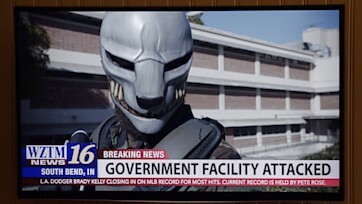 They go into the kitchen to make some lunch, but while they do, the TV shows footage of an attack on a government facility--the Watchdogs, who were briefly mentioned last week, have attacked and exploded an ATCU building, demanding that they get a list of who and where the Inhumans are. Ruben thinks it’s awesome... Mack, obviously, doesn’t agree. Coulson calls Mack and says he needs him back on the field since he’s one of the few agents available--getting rid of Hunter and Bobbi has made them short on manpower for obvious reasons. Mack protests since this was his week off, but Coulson stands firm and tells him to figure it out. Mack makes an excuse about why he need to leave and takes off, much to his brother’s disappointment. Back at the S.H.I.E.L.D. base, Coulson tells Daisy to rendezvous with Mack at the ATCU site in South Bend. Daisy is confused because she’s been following the Watchdogs online and she didn’t see this coming. The Watchdogs are basically glorified Internet trolls, and they’ve been around since the Battle of New York and got even more menacing after Sokovia. We skip to Mack, Daisy, and Fitz on site at the exploded ATCU storage site, where the Watchdogs have left their logo on the asphalt as a calling card. Fitz discovers traces of nitramene, something developed by Howard Stark after World War II to cause implosions. (This is so full of MCU references; I love it.) Fitz and Mack use science jargon back and forth, much to Daisy’s confusion. (She’s a hacker and is used to technical terms, so it's kind of hard for me to believe that she doesn't understand any of this.) Fitz and Mack realize that the Watchdogs have been making improvements to nitramene, and they also realize that they have a chemical on the plane that can neutralize the nitramine. Mack asks if they should take the ball of debris back with them, but Fitz says it weighs 100,000 tons because it’s an entire building. 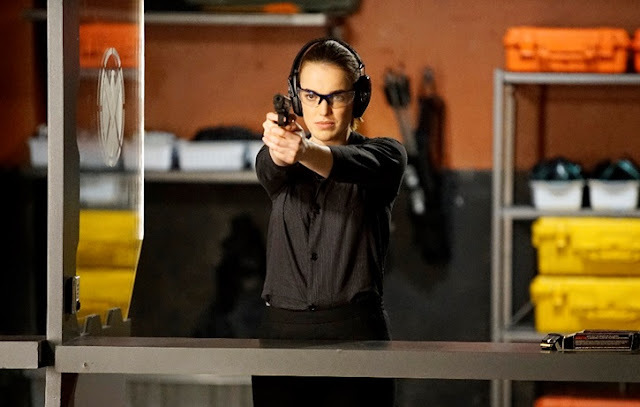 Jemma practices shooting in an effort to be prepared, and May meets her there. May gives her a pointer or two and then asks what this is about. Jemma explains that she blames herself for all the pain everyone went through in their attempts to rescue her. Jemma also blames herself for the murder of the Inhumans when she let Lash out of the containment module, saying that she did it to save her own skin. May insists it wasn’t her fault before walking away, and Jemma continues shooting practice. Fitz, Mack, and Daisy discuss what might be motivating the Watchdogs, and they decide hate can be a powerful motivator, considering Mack used to hate the Inhuman “alien crap” and his brother still does. Back on base, Coulson explains to Lincoln that since he worked with Felix Blake, he knows some of Blake’s secrets, like where his safehouses are. He says he wants Lincoln with him on this mission to find evidence that will help them shut Blake down. Lincoln is relieved, saying he thought Coulson wasn’t happy with his evaluation. Mack returns to his brother, who has had one too many beers and is upset with Mack. He’s struggling financially, particularly with the mortgage. Mack thinks that his brother asked him here so he could ask for money, but Ruben says that’s not why. He gets angry, indicating that Mack never helps them out... and he also goes on a rant that sounds terrifyingly like the Watchdogs. Ruben says they have the right idea and that the government controls everything. 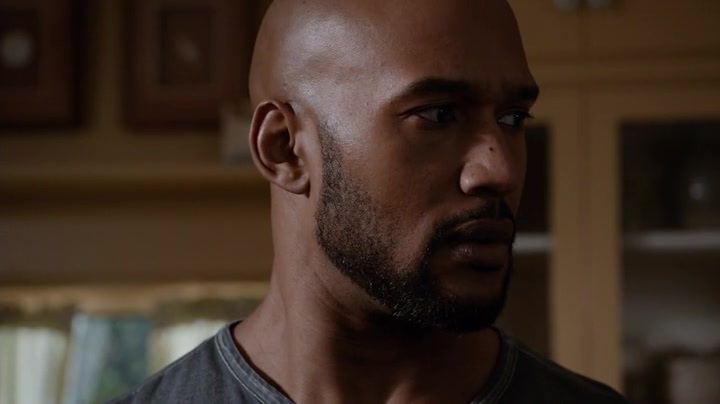 Mack realizes that Ruben’s been reading and directly quoting what the Watchdogs post online, and he tells Ruben to stay away, but Ruben gets mad and walks out. May shows Jemma all the information she has on Andrew Garner, her ex-husband, aka Lash. She says she’s looking for him because Lash is dangerous and needs to be stopped. She reiterates that Jemma isn’t responsible--only Lash is. 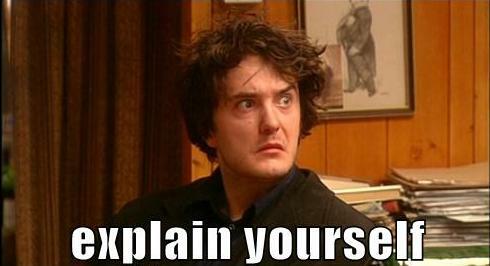 Jemma says she still feels guilty all the time and asks how to stop it. May says you don’t--you can only use it and channel it. Jemma asks if that’s what May’s doing, and she nods. 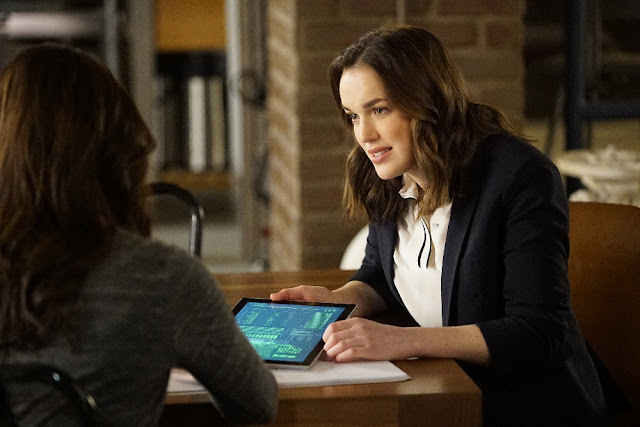 Jemma offers to help, and they get started. En route, Coulson and Lincoln discuss his evaluation. Coulson says that Lincoln is there for Daisy, not the cause, so commitment is a concern. He also says Lincoln has control issues, as evidenced by him almost electrocuting Creel last episode. Coulson says you can’t just be at S.H.I.E.L.D. ; you have to be a part of it, but Lincoln says Coulson doesn’t make that easy. He feels like there’s a test around every corner. Coulson’s concern lies in the fact that he’s vetted everyone on the team except Lincoln. He needs to know that Lincoln wants to be an agent and is committed to the ideal, just like Hunter and Bobbi were. 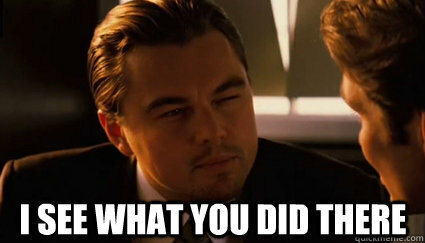 He tells Lincoln to stay in control and follow orders and then he’ll decide if Lincoln gets to be an agent or not. A truck drives down a street at night while the driver listens to a radio show with a caller who says they should be tracking the aliens (Inhumans). Daisy hits the truck with her Quake powers and then gets inside the truck. She threatens the driver, making his window shatter, and when he tries to escape, she makes his back windshield shatter too, all the while Fitz holds a gun to him. She wants to know where the Watchdogs operate from and says she won’t have to hurt him if he just tells her what she wants to know. Daisy calls Mack and tells him that the Watchdogs are meeting at Easterling Farms. He says he’ll meet her there. Right after he hangs up, Ruben enters the garage. Mack says he laid out all the parts for Ruben’s bike in the correct order so that Ruben can install them. Ruben invites Mack to eat lunch with him, but Mack says he “has a thing” and leaves. While looking over the information on Lash, Jemma explains that Lash is driven by his base instincts--to eat and to seek out potential victims. Jemma asks what will happen to Lash when May finds him, and May says that she’s got to kill him--she has no choice. 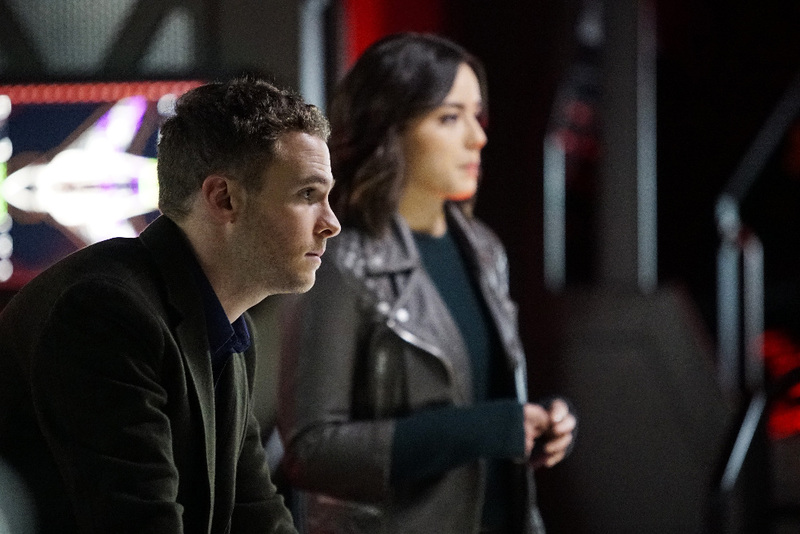 Jemma says that she and Fitz have been working on the vaccine from Creel’s blood and says maybe there is a choice. The vaccine would only work on Inhumans who haven’t turned, but since Lash hasn’t finished his transition, maybe they should at least try. May says no. Mack tries to get Ruben to go away, but Ruben grabs the attention of some guards, which causes Mack to have to attack in self defense. Daisy also does, using her quake powers, but some Watchdogs see this and think that Mack is the one producing the shockwave. Ruben leaves, and Mack tells Fitz and Daisy to retreat while Mack “puts a lid” on this. After Mack’s gone, Daisy decides to invade by herself, saying she has a shot at stopping Blake. She invades the barn but finds Blake absolutely gone, like he disappeared. 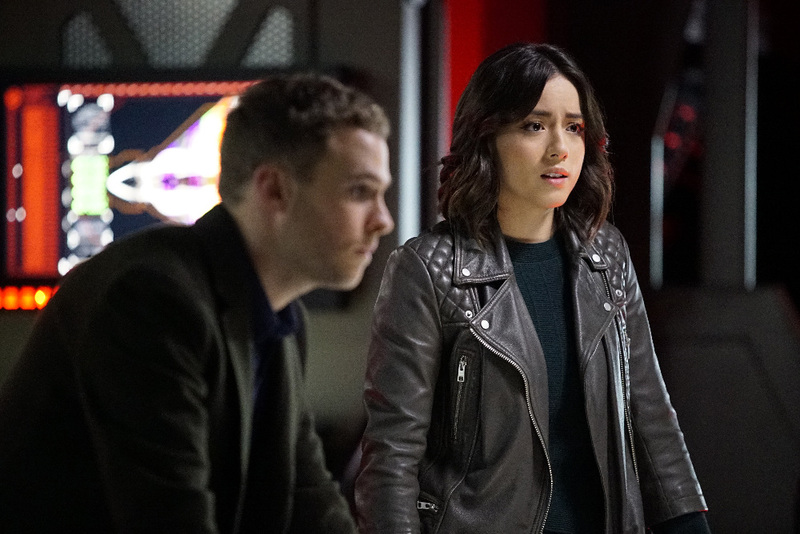 And at Blake’s safe house in Atlanta, Coulson and Lincoln trace the strange noise to the basement, where they find none other than Felix Blake. Back at Easterling Farms, where Blake should be, Fitz is discovered and shot with orange goo--nitramene. When Daisy tries to neutralize it, it doesn’t work because of the improvements that Blake made. It’s only slowed the process down, which means that at some point, Fitz will implode. Blake cites the fact that S.H.I.E.L.D. brought the Chitauri to earth and that the Avengers created Ultron as reasons why he isn’t really appreciative of Coulson’s organization. Coulson calls Blake’s bluff and realizes he’s stalling. A containment module has arrived for Fitz, and the nitramene is digging into his skin (so cutting it off isn’t possible). They have a Watchdog soldier with them, and Daisy tries to get him to talk. He says he doesn’t know what Blake put in to “suspend” the nitramene, and that one word gives Fitz a clue as to what’s going on. They realize they can possibly freeze it using liquid nitrogen, which they have in the containment module. Daisy goes on the hunt. Coulson tries to get Blake to see that he’s really working for Hydra, but Blake spins it around and indicates that they found out the location of his compound via coercion (which is true). Coulson agrees that hate is a good motivator, then says that Lincoln is full of it. 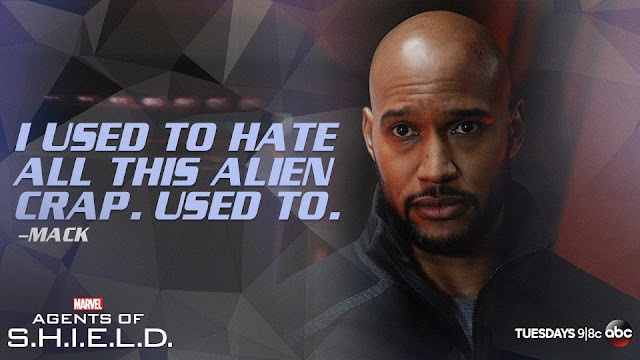 He says Lincoln, as an Inhuman, wants really badly to kill Blake, but the only reason he’s not is because he’s trying really hard to follow Coulson’s orders. So... Coulson changes his orders. Lincoln protests, but Coulson orders him to do it. When Lincoln does, it shuts down the projection of Blake. Daisy freezes off the nitramene on Fitz’s neck, and it works, thankfully. Daisy then turns to the Watchdog soldier in the module with them and says she’s turning him over to the ATCU. ...and Coulson realizes that Lincoln didn’t zap to kill. He appreciates that Lincoln offered a dissenting opinion but ultimately did what Coulson asked... albeit a slightly less lethal version. Coulson gives Lincoln his approval, and they decide to go through the safe house to see if there’s a second target that Blake’s planning to attack. Mack arrives home, and Ruben is waiting for him. He’s mad that Mack hasn’t told him the truth and says he’s a liar. Coulson and Lincoln realize that there was no second target--Blake baited them. He wanted them to bring him an Inhuman, someone for them to go after. Mack and Ruben continue arguing as cars pull up in front of their house. 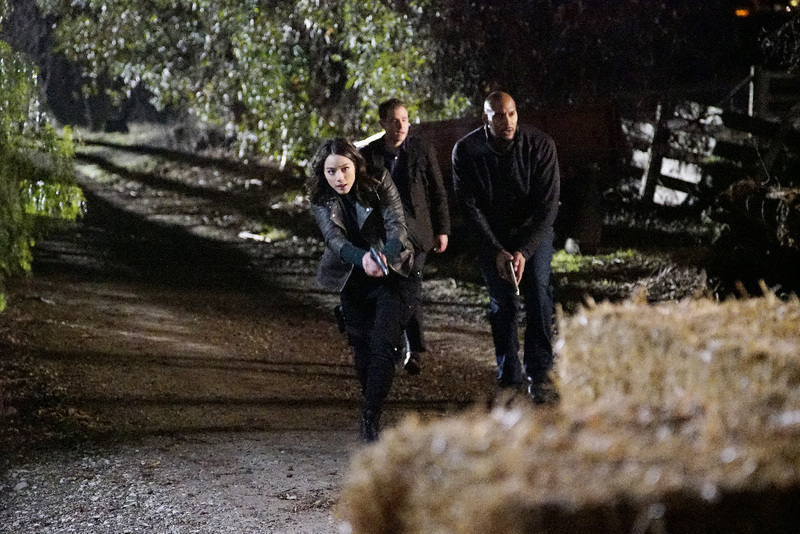 They're after Mack, who they think is the Inhuman. The Watchdogs torch Ruben’s bike and then invade. Mack finds his dad’s shotgun and formulates an escape plan. They make their way through the house in the dark and shoot down three out of five Watchdogs. The other two are waiting for them outside the kitchen door, which was their escape route. In the kitchen, a Watchdog they miss finds them and shoots Mack in the arm. The Watchdog then goes after Ruben, but Mack chops him down with a meat cleaver. As more Watchdogs try to bust through the door, Mack duct tapes the meat cleaver to the shotgun. HE FINALLY GOT HIS SHOTGUN AXE. Daisy can’t wait to use “Alfie” on Mack, and Ruben asks what they call his brother instead. Daisy says they call him Mack, and Ruben says that’s what his buddies call him. (Two Macks!) Daisy says maybe they’ll give Ruben a call sometime to enlist his help, then expresses regret that she wasn’t there for him since she’s his partner. Ruben asks if Mack is good at saving people, and Daisy says that if she needs someone to watch her back, she turns to Mack. She then asks if he wants a ride. Back at base, Daisy shows Coulson surveillance footage that places a company car at the ATCU building. 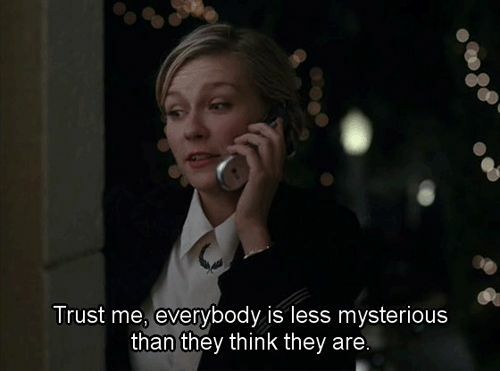 She traced it back to Malick, who is feeding the Watchdogs Intel and getting them fired up. They also have no idea what Malick took from the ATCU facility. We see that same company van drive into a barn, where Giyera appears and Blake wheels out of the shadows. (He’s in a wheelchair from that time when Deathlok broke his spine.) Blake reiterates his wish to hunt down all the “freaks,” and Giyera tells Blake that if all goes according to plan, Blake will get the army he so desires. The camera pans to show us a white missile in the back of the van. While this episode wasn't my favorite of the series or even the season, it was still a solid installment. It was predictable in many ways, but I did enjoy getting a look at Mack's brother and family life. I also loved the subplot with Jemma and May searching for Lash. I also thought the Watchdogs were an interesting idea, and I can tell things are starting to build up for Civil War. While I still miss Hunter and Bobbi, this was a nice transition from their departure back into normalcy. I also felt like we got to see more of some characters we haven't seen in a while, so that was awesome. But, again, Hunter and Bobbi are gone... so, it's a trade off. The biggest issue I had with this episode (other than its predictability and Blake's two-dimensional character) was Daisy. It's becoming harder and harder for me to understand her motivations, and I didn't like the choices she made in this episode. I'm hoping things get back to normal with her or at least to a place where I can understand where she's coming from. At the moment, all of her decisions and characterization seem to come out of the blue. Ultimately, though, this episode was perfect because... well, SHOTGUN AXE. Have you seen "Watchdogs" yet? What did you think of it?